A first-time All-Star last season and eighth in the National League Cy Young voting, Mike Foltynewicz's 3.9 fWAR was the ninth-best among qualified NL starters. KISSIMMEE, Fla. — The last challenge for Mike Foltynewicz was in discovering a level of consistency that fueled a breakout season that included an All-Star Game appearance and top-10 finisher in the National League Cy Young voting. Now, catcher Tyler Flowers sees a clear next step in the evolution of the Braves’ right-hander: it’s time for the 27-year-old to become a veteran leader in a clubhouse full of ultra young arms. “I think what he did last year kind of puts him in that role whether he wants to be or not, whether he’s ready for it or not,” Flowers said. “When you have success at this level there are lot of things that you’re apparently doing right and other guys kind of congregate to that to improve themselves and their careers. Foltynewicz earned that added responsibility after going 13-10 over 31 starts with a 2.85 ERA, 142 ERA+ and 202 strikeouts to 68 walks and throwing a career-high 183 innings, up nearly 30 from 2017. His 3.9 fWAR was the ninth-best among qualified NL starters and amounted to a dramatic jump for a pitcher who was often marked by mere glimpses of his tantalizing talent when he posted 1.3- and 1.8-fWAR seasons in 2016 and ’17, respectively. His mental approach to trouble within a start had become a sore subject, a talking point that followed him into springs, and reared its head again through Foltynewicz’s first five starts of 2018, when he averaged 100 pitches per outing and had had gotten through the fifth inning just once. But fast-forward to the break and Foltynewicz had six outings of six innings or more, including holding the eventual champion Red Sox to three hits over seven innings in Fenway with seven strikeouts on May 27 and he threw a complete game shutout of the Nationals on June 1 in which he fanned 11 and gave up just two hits. No NL starter had a better June ERA than Foltynewicz’s 1.13 ERA and he had the sixth-most strikeouts in the month of August. The building troubles that Foltynewicz would often deal with as he allowed 1.31 home runs per nine innings in ’16 and 1.17 in ’17 disappeared as he allowed just 0.84 over his 31 starts, which was top-10 in the NL. Foltynewicz recounted one start when Flowers came out to him after getting out of a jam and joked that he had righted himself after one pitch instead of three batters. "You got yourself under control in one pitch rather than three batters that time." The new Foltynewicz was likely introduced to the baseball universe outside of Atlanta in Game 4 of the NLDS against the Dodgers. After failing to make it past the second inning when he was tagged for four runs, three walks and a pair of homers on just 50 pitches in Game 1 in Los Angeles, manager Brian Snitker went with the righty again in Game 4 back at SunTrust Park. Foltynewicz responded with four strong innings, yielding two hits and one run over four innings. Snitker has yet to name the Braves’ Opening Day starter, a mantle that Julio Teheran has held each of the past five seasons to tie Rick Mahler for the longest streak since the team moved to Atlanta in 1966. 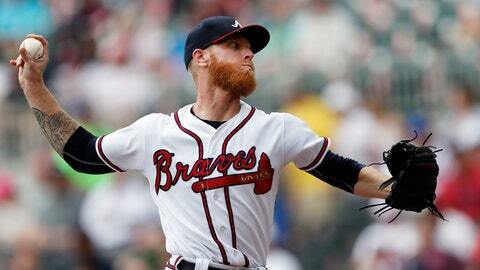 But that’s likely to end amid Teheran’s setback of a season and Foltynewicz’s ascension. He’s already the statistical headliner of a rotation that has four perceived locks with with fellow righty Teheran and Kevin Gausman and lefty Sean Newcomb and a number of the Braves’ heralded prospects — Kolby Allard, Max Fried, Luiz Gohara, Mike Soroka, Touki Toussaint, Bryse Wilson and Kyle Wright — vying for a final spot that could be fluid throughout the season. That’s where Foltynewicz the leader comes in, helping to shepherd a group of wunderkinds, with Fried, 25, the only one older than 22, and offering a reminder of what led to the best season of his five-year career. "He pushed me and I pushed him and Charlie Culberson was there and we had a fun offseason together." Flowers saw this promise years ago, when he first caught Foltynewicz in 2016, and believed then he had “the best arm and best stuff” that he’d ever caught, and mind you, Flowers spent years catching Chris Sale with the White Sox. He watched Foltynewicz flirt with moving into the game’s elite starters, watching him give up a home run to lose a no-hitter in the ninth inning in Oakland in 2017 and fanning 10 Reds over seven scoreless innings that same season. Last year, Flowers believes, may have just been the beginning of Foltynewicz reaching his potential.